Participants will share their past, current and future recreational interests and explore the value that recreation has had in their lives. Build two squares from the 36”Toobeez and one square from the 24″ Toobeez (as pictured above). Group Size: Small group or individual. Appropriate caution is important to conduct activities in a safe manner. Be sure to review these reminders prior to beginning the activity, and share reminders with the group if necessary. Remind participants of the risk of falling when stepping over the Toobeez on the floor. Physically assist participants when necessary. Activity Challenge:Participants will share their past, current and future recreational interests and explore the value that recreation has had in their lives.4. 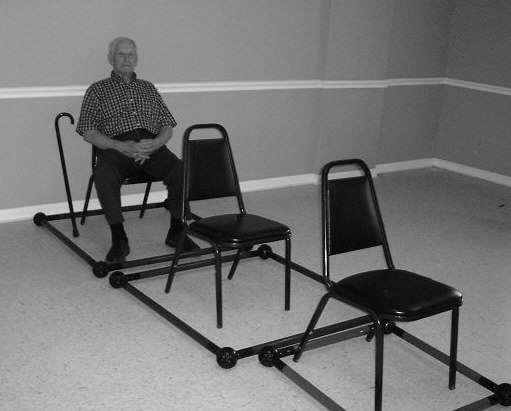 Explain to the participants that the last chair (furthest back) represents the past, the middle chair represents the present, and the first chair represents the future. 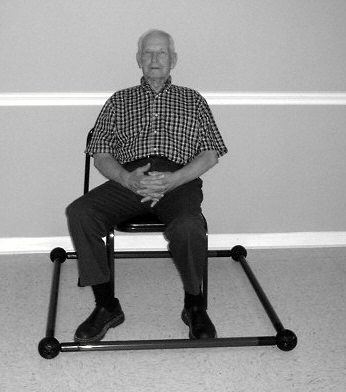 In the “past” chair, the participant should state his or her recreational interests from the past. Participants will then repeat this step for the “present” and “future” chairs. 5. Remind participants that only the person seated in the Time Machine shares, while the observing participants around the Time Machine listen.The observing participants may ask questions of the person in the Time Machine. 6. The therapist or activity professional may go first to model how to work through the Time Machine. 7. Each participant will then take a turn in the Time Machine to share their past, present and future recreational interests. What did you play during the summertime? Can you remember a favorite birthday party? 9. The therapist can record each participant’s response on the chart paper to compose a group list of fun recreational memories and activities. 10. If your group is struggling, or if you feel your group would benefit from an additional challenge, present a variation provided below. 11. After the activity, move to the “Activity Discussion and Processing” section. Here are the available Teambuilding Training Options. Other topics could be explored such as past accomplishments, achieved goals or favorite family memories. 3. Play charades with the Toobeez. Rather than talking, have the participants act out their favorite activities using the Toobeez. The observing participants outside of the Time Machine can guess the participant’s favorite past, present and future activities. The observing participants can also make objects out of the Toobeez to prompt more responses. How did you feel when you first learned of the Time Machine? Has recreation had value or importance in your life? Does all your recreation have to be productive? What stage of life was the most fun for you? What are the best things about your age now? Have you enjoyed looking at your life through play?